Something big has recently happened. And not many people are talking about it. Like companies and individuals, even federal governments sometimes need to borrow money. They borrow money by issuing what’s called a Government bond. These bonds, like all loans, have an interest rate associated with them; a bond’s interest rate is referred to as its yield. Those of us who don’t follow these yields would have assumed that typical Government bond yields be something in the low single-digit range (e.g., 2% to 5%). Until recently, we would have been right. Beginning in January of 2016, the Government bond yields of three of the world’s largest economies, the USA, Germany, and Japan, all fell below 2%. But that’s not why 2016 will go down in history. No. 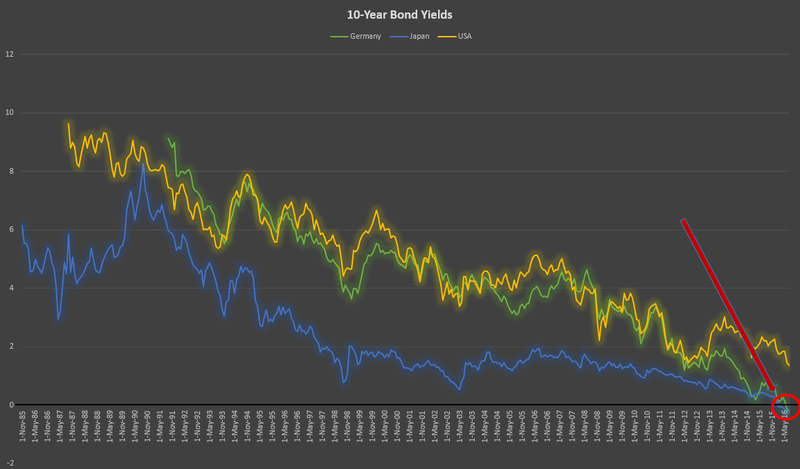 For the first time in history, in February of 2016 (in the case of Japan) and in June of 2016 (in the case of Germany), Government bond yields went negative. Here’s a chart showing yields over the last few decades. What does this mean? Until recently, most economists would’ve told us this wasn’t even possible, so it’s hard to say what it actually means. After all, why would one lend the government money only to be paid less than they loaned? A negative bond yield is essentially paying the bank to keep your money. What it does mean is there’s so much demand for these bonds that governments can offer increasingly lower interest rates. But negative rates? Something has to give before the trajectory continues to take rates much lower. I contend that, while it’s not yet clear what this means to us in the present, some time in the future, we’ll talk about how we should’ve seen the warning signs that showed up in 2016. This is the year when we broke a fundamental economic assumption for the first time. 2016 will go down in history. Nice article! Do you think negative interest rates in other countries will cause massive investments in the US bond market, the safest investment in the world? Andrew, I think you’re exactly spot on as to why there’s remained such strong interest in the US Dollar and US government bonds: comparatively-speaking, they’re seen as safe bets.